This is a method of growing plants in a shallow stream of nutrient solution continuously circulated along plastic troughs or gullies. 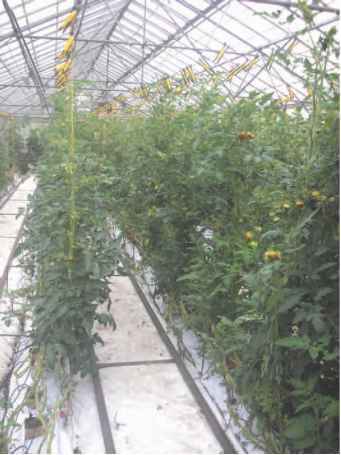 The method is commercially possible because of the development of relatively cheap non-phytotoxic plastics to form the troughs, pipes and tanks (see Figure 22.5). 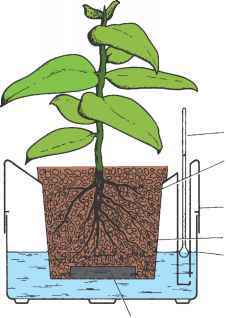 There is no solid rooting medium and a mat of roots develops in the nutrient solution and in the moist atmosphere above it. Nutrient solution is lifted by a pump to feed the gullies directly or via a header tank. The ideal flow rate through the gullies appears to be 4 litres per minute. The gullies have a flat bottom, often lined with capillary matting to ensure a thin film throughout the trough. They are commonly made of disposable black or white polythene set on a graded soil or on adjustable trays. There must be an even slope with a minimum gradient of 1 in 100; areas of deeper liquid stagnate and adversely affect root growth (see aerobic conditions). Figure 22.5 Nutrient film technique layout. The nutrient solution is pumped up to the top of the gullies. The solution passes down the gullies in a thin film and is returned to the catchment tank. The pH and nutrient levels in the catchment tank are monitored and adjusted as appropriate. meter and by careful observation of the plants. Maintenance of pH between 6 and 6.5 is also very important. Nutrient and pH control is achieved using, as appropriate, a nutrient mix, nitric acid or phosphoric acid to lower pH and, where water supplies are too acid, potassium hydroxide to raise pH. Great care and safety precautions are necessary when handling the concentrated acids during preparation. The commercial NFT installations have automatic control equipment in which conductivity and pH meters are linked to dosage pumps. The high and low level points also trigger visual or audible alarms in case of dosage pump failure. Dependence on the equipment may necessitate the grower installing failsafe devices, a second lift pump and a standby generator. 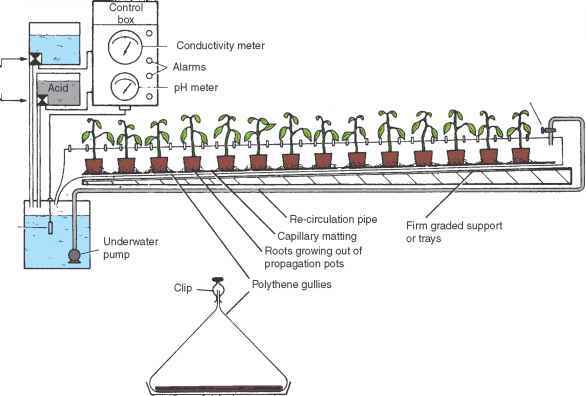 A variation on this method is to grow crops such as lettuce in gullies on suitably graded glass house floors (see Figure 22.6). containers, on which the plants sit, are drip fed with a complete nutrient solution at the top with the surplus running out through slits near the bottom on the opposite side. When this method was first developed the NFT systems were copied, i.e. the water was recirculated, but it was soon found to be difficult where the quality of water was poor and there was a risk of a build-up of waterborne pathogens and trace elements. It was found that the surplus nutrient solution was most easily managed by allowing it to run to waste into the soil. However, this open system presents environmental problems and increasingly a closed system has had to be adopted. It is now becoming more usual to run the waste to a storage sump via collection gullies or pipes. Some of this can be used to irrigate outdoor crops if nearby. To recirculate the water it is necessary to have equipment to remove the excess salts or accept a gradual deterioration of the nutrient solution and then flush it out to a sump when it becomes unacceptable. Sources of infection such as Pythium are minimized by isolation from soil and using clean water; the risks of recirculating pathogens is addressed by using one of the four main methods of sterilization (see water quality). The specifications for sports playing surfaces are such that turf has increasingly given way to artificial alternatives, typified by the trend toward playing 'lawn' tennis on 'clay' courts. This is partly attributable to maintenance requirements, but at the higher levels of sport it is because the users or the management expect play to continue with a minimum of interference by rainfall. The usual problem is that the soil in which the turf grows does not retain its structure under the pounding it receives from players and machinery, especially when it is in the wet plastic state. Turf is still preferred by many, but to achieve the high standards required it has to be grown in a much modified soil (see also sand slitting) or, increasingly, in an alternative such as sand. The most extreme approach is to grow the turf in pure sand isolated from the soil, sometimes within a plastic membrane. The high cost of these methods is such that it is only used to create small areas such as golf greens. 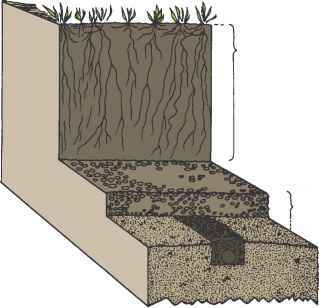 Drainage layer: Pea gravel to drainage pipes consisting of washed, pea-sized gravel, as shown in Figure 22.9 . Because it is considerably coarser than the sand placed on it, this layer prevents the downward percolation of water (see water films) and creates a perched water table. This helps to give the root zone a large reserve of available water whilst ensuring that gravitational water, following heavy rain or excess irrigation, is removed very rapidly. A 25-30 cm root zone of free-draining sand is placed uniformly over the drainage layer, evenly consolidated. Allowance has to be made for continued settling over the first year. It is essential that the sand used has a suitable particle size distribution, ideally 80-95 per cent of the particles being between 0.1 and 0.6mm diameter. A minimum of 'fines' is essential to avoid clogging up of the pores in the root zone (see Figure 22.2). Sometimes a small amount of organic matter is worked into the top 5 cm to help establish the grass, although success is probably as easily achieved with no more than regular light irrigation and liquid feeding. Some very sophisticated all-sand systems, such as the cell system, are constructed so that the root zone is sub-divided into bays with vertical plastic plates and supplied with drains that can be closed so that the water in each of them can be controlled. Tensiometers are used to activate valves that allow water back into the drainage pipes to sub-irrigate the turf. State the main disadvantages of growing in soils. Describe what is required of a material to be used in a compost. State the advantages and the disadvantages of loam based composts. State the advantages of loamless compost. Explain why alternatives are being sought to replace peat in growing plants. 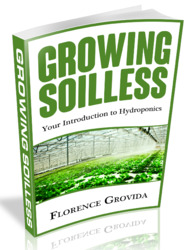 State the advantages of hydroculture growing systems. Bragg, N. (1998). Grower Handbook 1 - Growing Media. Grower Books. Bunt, A.C. (1988). Media andMixesfor Container Grown Plants. Unwin Hyman. Cooper, A. (1979). The ABC ofNFT. Grower Books. Handreck, K.A. and Black, N.D. (2002). Growing Mediafor Ornamentals and Turf. Revised 3rd edn. New South Wales University Press. McIntyre, K. and Jakobsen, B. (1998). DrainageforSportsturfandHorticulture. Horticultural Engineering Consultancy. Mason, J. (1990). 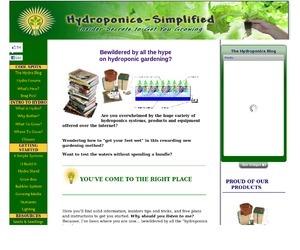 Commercial Hydroponics. Kangaroo Press. Molyneux, C.J. (1988). Practical Guide to NFT. Nutriculture Ltd. Pryce, S. (1991). The PeatAlternatives Manual. Friends of the Earth. Smith, D. (1998). GrowerManual 2 Growing in Rockwool. Grower Books. How to irrigate using a dosing pump? How to grow tomato in nft?